I love it, though! In fact, The Breaks is one of my favorite novels of Price’s, and the only one I had re-read purely for pleasure before starting this blog. Peter’s uneasy about a lot of things, actually, some of them specific to new independence and some more universal: The frustratingly impressive achievements of people as young as him or younger, the dice-roll gamble of love at first sight (“eyes and face and voice and praying to God that the brains and personalities clicked later on and you didn’t wind up ripping out each other’s lungs when the bubble popped”), the mental race to come up with a witty line in conversation. This is one of the best books I’ve ever read at capturing life’s baseline anxiety. As sharp as Peter/Price’s voice is, though, it’s worth noting that one of the most subtly impressive things about the book is its nuanced depiction of the supporting characters. Comedies centered around an alienated protagonist often go out of their way to make the ensemble players seem like weirdo grotesques, but here even the characters that Peter is routinely frustrated with–his father, his stepmother, his old professor Fonseca–frequently sound reasonable enough, in their own way, when they open their mouths. They’re screwed up, sure, but not necessarily any more than Peter is, and you get the sense that there could be a whole book from any of their perspectives if we weren’t settled inside Peter’s head. We are, though, and one of the most interesting things about The Breaks in the context of Price’s body of work is that Peter is the ultimate incarnation of Price’s chatterbox protagonists. Like Stony de Coco and Kenny Becker before him (and Ray Mitchell after), Peter is a compulsive joker, but he takes the habit to its logical extreme, aspiring to become a stand-up comedian (another plot element that endeared me to this book). For the most part, Price nails the experience of starting out in comedy–the idolization of those who have mastered it, the painstaking construction of a new bit, the awkward rhythm of a new comic’s delivery. And the routines that are depicted as going over well do in fact seem genuinely funny, a big potential pitfall for any non-comic trying to write for comedian characters. I do have one quibble: There’s a scene that seems to suggest that a good stand-up bit is the product of onstage, in-the-moment revelation rather than intensive planning, trial and error, and revisions. That’s a longstanding myth, and one which comedians themselves tend to reinforce; convincingly delivering your material as though it’s all off the top of your head is one of the medium’s central skills. But that’s an illusion more often than it is a reality, and it’s the kind of thing about which I’d usually expect Price to know better. Again, though, that part only stands out because everything else feels so identifiable and authentic. As for the structural looseness of the plot (the bulk of the story takes place after Peter’s return to the Straight campus, but it takes over 100 pages and a year’s time within the story to get there): I don’t know what to tell you. I’m sure a lot of people would be frustrated with this book’s digressive pacing (and its neurotic protagonist), and it’s definitely not the first novel I’d recommend to Price newbies. But I enjoyed it all the way through, and when I got to its up-in-the-air ending, I wasn’t unsatisfied. As I said, that doesn’t seem to have been the case for the book’s author. 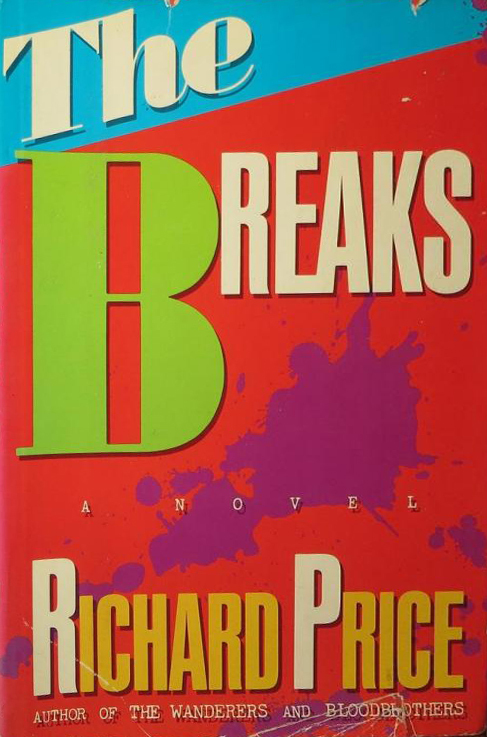 The Breaks was written “in a blind panic,” Price has said, “because I couldn’t think of anything to write about… All of a sudden I ran out of autobiography and I started spinning my wheels… [I]f you have enough talent you’ll deliver readable page after readable page after readable page”–which, some might say, doesn’t sound so bad–”but all of it will add up to nothing because you’re just treading water.” Price was also dealing with a coke addiction at the time, and while each of his previous books had taken two years to produce, The Breaks took five. After that he began to focus on screenwriting, and it would be another nine years before he released his next novel, one which would turn out to be arguably his best work and which would set a new template for his writing going forward. But again, if he had spent the rest of his career writing books like The Breaks, that wouldn’t have been the worst thing in the world. • To go back to the subject of autobiography, The Breaks features a whole ton of scenes that are identifiable as remixed versions of anecdotes from Price’s actual life: Peter’s monster movie marathons with his mom (see this Moth storytelling session–possibly the closest we’ll ever get to hearing Price do stand-up himself–about Price’s maternal grandmother), Peter getting rebuked for his poor spoken English (see the punchline of this essay), Fonseca being inspired by jealousy of a pharmacist’s child (same essay), Kim’s story about a woman being sent as a thank-you present (an anecdote which Price mentions in this interview and which he also used as the inspiration for Mad Dog and Glory). Perhaps the most appropriate example is when Peter convinces a student to write about his own first-hand experiences (same interview). • Peter graduates in 1971 (around the time Price himself would’ve been getting out of college), making The Breaks a bit of a period piece like The Wanderers, albeit with much less of an emphasis on period atmosphere. • Another Freedomland reference: Fonseca claims to have seen Smokey Robinson perform at the Bronx amusement park which would serve as the namesake for Price’s 1998 novel. Next week: Richard Price finally makes the jump to screenwriting with the 1986 Martin Scorsese film The Color of Money. This entry was posted in Books and tagged books, comedy, fiction, literature, novels, richard price, stand-up, the breaks. Bookmark the permalink.